The volcanic cone, of Stromboli, rising from the sea floor of the Mediterranean, dominates many of the seascapes of the Aeolian Islands. It is the volcano of children’s picture books. We approached the island on the car ferry from Salina, calling at the small village of Ginsotra before carrying on to the main settlement at San Vincenzo. Today’s population of about 500 is significantly lower than the several thousand people who lived on the island at the end of the 19th century. After an early breakfast, and a quick glance at the warning signs regarding tsunamis we headed around the island in a clockwise direction. Agnes, our guide and friend from Planete Kayak, knows the area well and proved to be an ideal leader, sharing her knowledge and enthusiasm for the area. When you see signs like this you know that you are in an earthquake prone area. Sorting equipment on the beach on Stromboli, whilst the volcano towers above. Ash flows indicate the continued active nature of the volcano. Onto the west coast we reached the small village of Ginostra. About 40 people live year round in this small village with the only reasonable means of access being by boat. The small harbour is supposed to be one of the smallest in the world although a larger one for the ferries was constructed in 2004. Ginostra harbour, reputed to be one of the smallest in the world. A solar powered boat winch in the small habour at Gionstra. 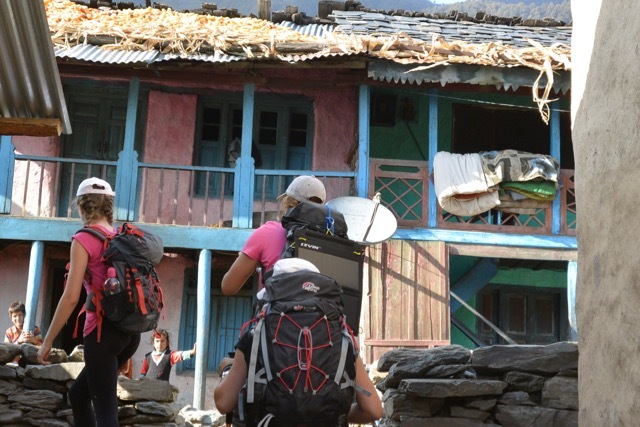 Solar power is the only source of electricity in this small, isolated village. Leaving the harbour we turned north and approached one of the most amazing physical spectacles I have seen anywhere. Sciara del Fuoco, a slope of ash and lava, rising nearly 900 metres from the sea. Although the sun was really in completely the wrong place to take reasonable photographs you couldn’t help but be overwhelmed by the sheer size of the slope. We continued our circumnavigation of the Island, landing back at the harbour, prior to catching the early morning car ferry back to Vulcano. What is certain is that Stromboli is one of the most dramatic places that I have ever paddled and feel certain that I will return at some point in the future. Leaving Stromboli on the ferry for Vulcano. We hastily left the ferry on Lipari, when the winds prevented the ferry docking on Volcano. For various reasons over the last few months I just haven’t had the time to update the content on the site, partly because I have been fortunate enough to be out kayaking, several times each week. Things are changing and hopefully I will be able to add content on a more regular basis. In addition I have moved the content from the blog into a new format, which should give more flexibility with the updates. It has certainly been a busy few months with sea kayaking in Jersey’s waters taking place on a regular basis. I have also been fortunate enough to visit some amazing paddling destinations which I am planning to write about over the next few weeks and months. Greenland has featured again in our paddling adventures but so have some new areas such as Spain and Mauritius, both of which offered kayaking of a surprisingly high standard, with delightfully warm weather and water. One of the biggest changes is that retirement has arrived which allows for significantly more time to explore Jersey’s local waters. It wasn’t until I finished work that I realized just how good the weather is during the week, enabling visits to our favourite reef, the Ecrehous to take place on the quieter days during the week. My finishing work has coincided with a number of other people coming to the end of their careers, which has meant that there is always somebody to go paddling or coasteering with. Over the coming months there will be updates with useful information for those who wish to kayak in the Channel Islands, with suggestions of great paddling destinations further afield. Kayaking off the north coast of Mauritius. Other photographs of our more recent kayaking trips can be seen here. After a good nights sleep we woke to another beautiful day, which wasn’t all good news as we would be exposed to the sun at times as we gained nearly 1,000 metres in height. As the height increased there was a corresponding expansion of the view. Snow capped peaks started to appear in several directions. The young people were quite amazing, despite how strenuous the day was I didn’t hear a single complaint or negative comment as we climbed through the forest. It was interesting to note that in several places trees showed clear evidence of being struck by lightening. Thankfully the weather was looking settled with not a cumulo-nimbus in sight. 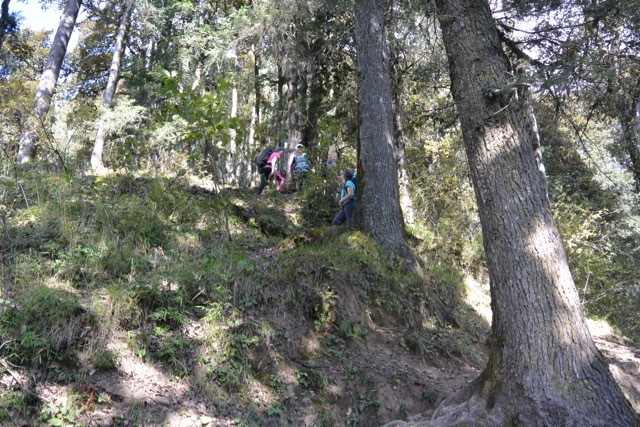 As we broke through the tree line we emerged onto a col where we were going to spend the next two nights, part of the acclimatization process, as we climbed higher into the mountains. We did attract the attention of some of the local wildlife. This gives an idea of the gradient of the path. Overall we probably spent 5 hours walking uphill at this angle. The trees offered some welcome shade from the noon day sun. Above the tree line we reached a col, with a particularly steep drop into the next valley. Although some of the summits were covered in cloud it was clear that there had been a fresh snowfall higher up, which wasn’t particularly encouraging. 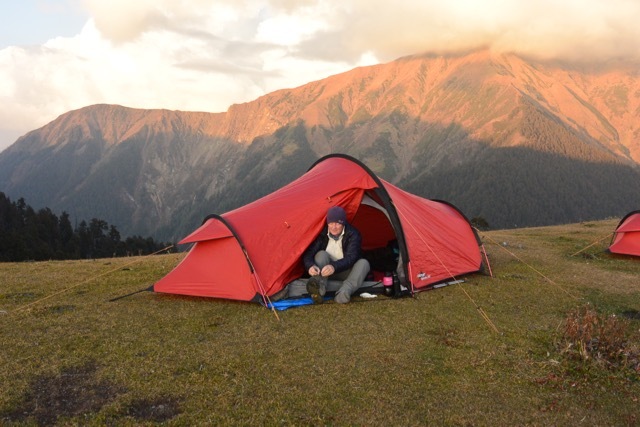 Tents were pitched on the col and it was immediately time to find the down jackets, the temperature was dropping like a stone. By 6.00 pm all of the tents were covered in a layer of ice and the thermometer kept going downhill for the next 10 to 12 hours. It turned out to be one of the coldest nights I have ever spent in a tent. The tents did catch the last of the suns rays. 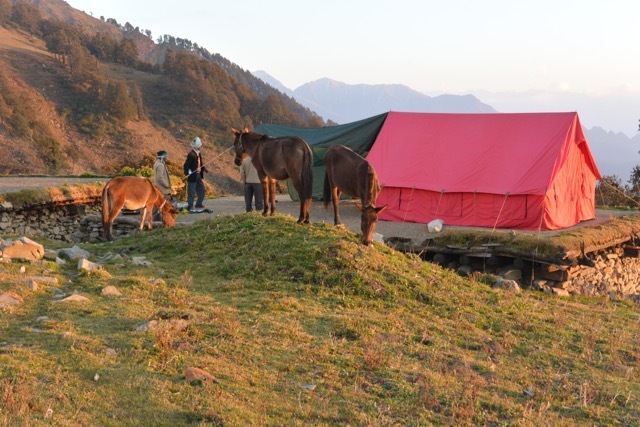 The food tent was pitched on the flat roof of one of the huts. During the warmer summer months the local shephards bring the animals up to the higher pastures but in the autumn we were pretty certain that we would have the area to ourselves. As the sun sets over Pakistan we retired to the food tent to warm up, knowing that this would also be our camp site the following evening. Tomorrow was meant to be an easier day after two long up hill treks. 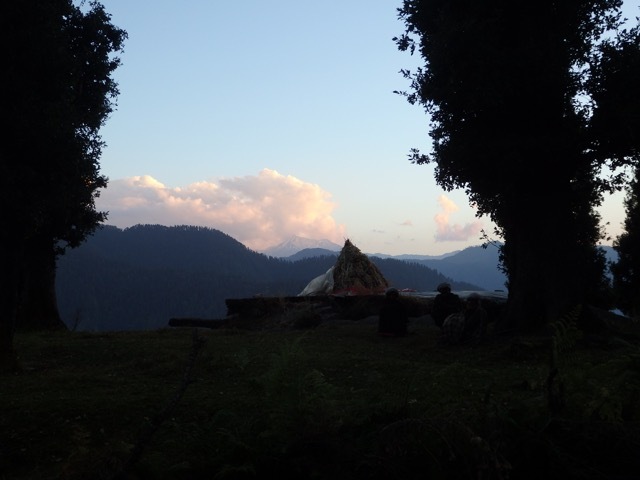 After the heat and madness of Delhi it was a pleasure to arrive in the Chamba Valley, in Himachal Pradesh, in north west India. 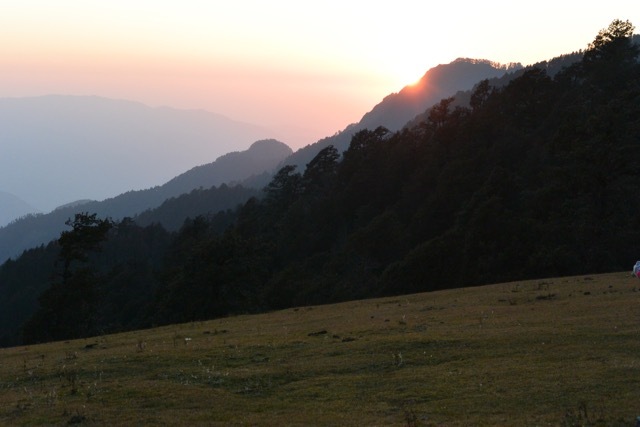 We were here to trek for 8 days through the mountains of this Indian State. 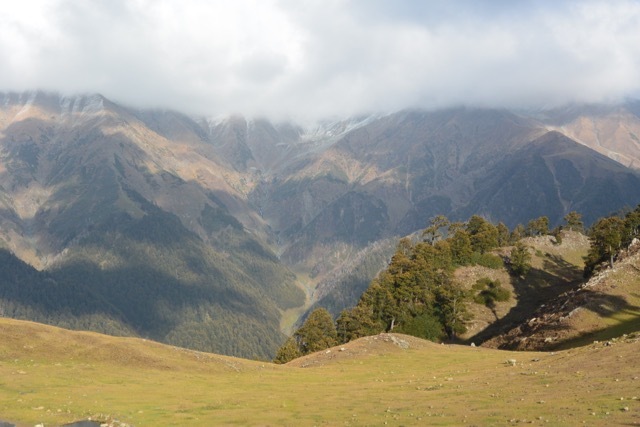 On the drive from Pathenkot, a town we had traveled to by overnight train from Delhi, there had been some distant views of snow capped peaks, but now they seemed within touching distance. Initially we stayed at the beautiful Orchard Huts, which is a superb place to stay if you happen to find yourself in this corner of the Indian sub-continent. Our convoy of jeeps traveled to the road head, from where we started our climb. We caused quite a stir, with local school children coming out of the classroom to watch us pass by. 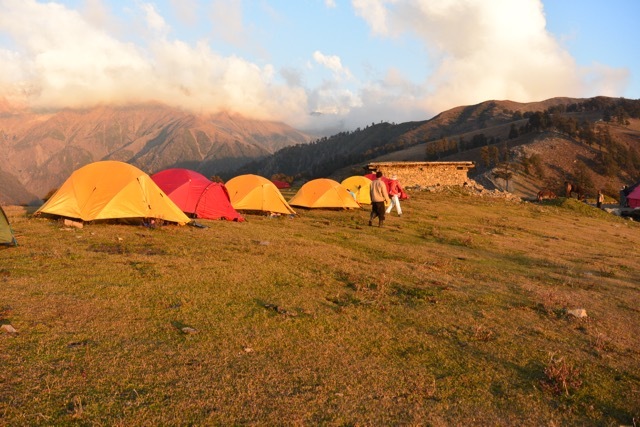 Camp that evening was at 2,450 metres, we had climbed nearly 1,000 metres from where we started in the morning. 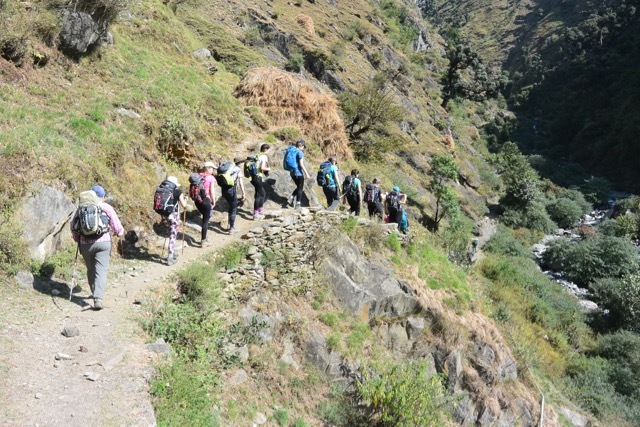 The first part of the trek involved some sections of downhill as we followed the course of the river, prior to heading up the ridge towards higher land. 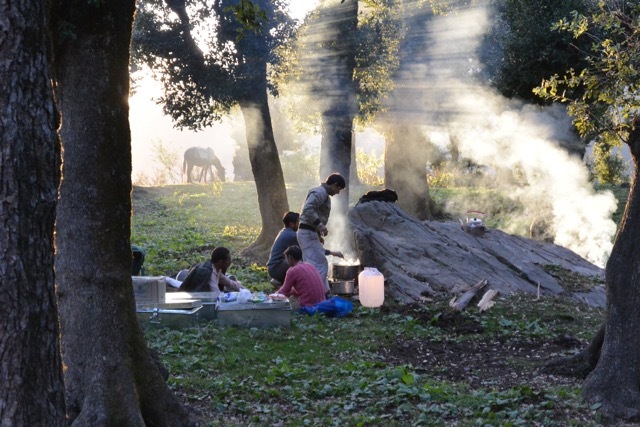 Fortunately a lot of the route was through trees, providing welcome shade from the Indian sun. 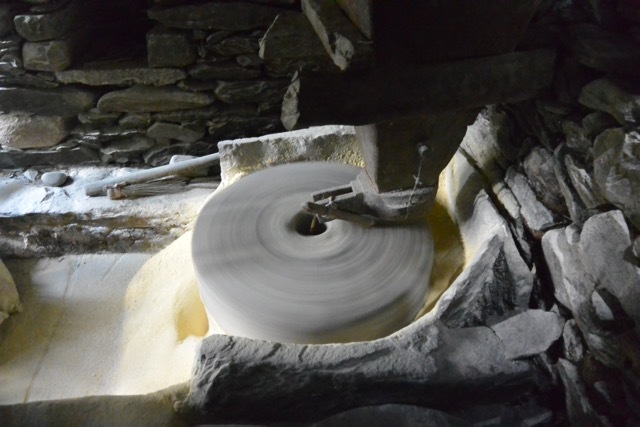 This water mill was busy grinding local flour. It reminded me of the old tidal mills in northern Brittany, some of which have been lovingly restored. 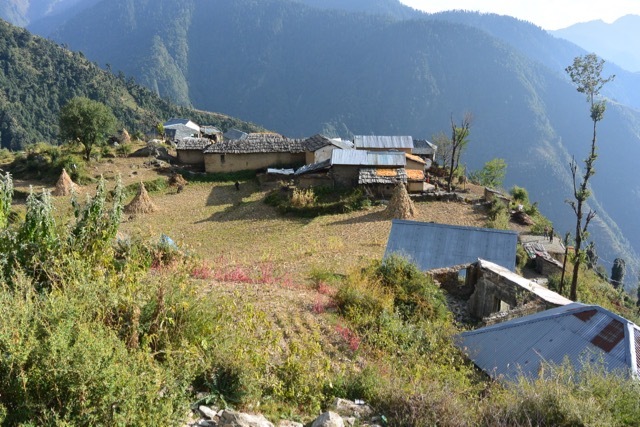 This was the last village we passed through as we climbed out of the valley. Little did we realize that we would be camping in this village a week later. Looking back to the village. It was clearly a rich agricultural region. 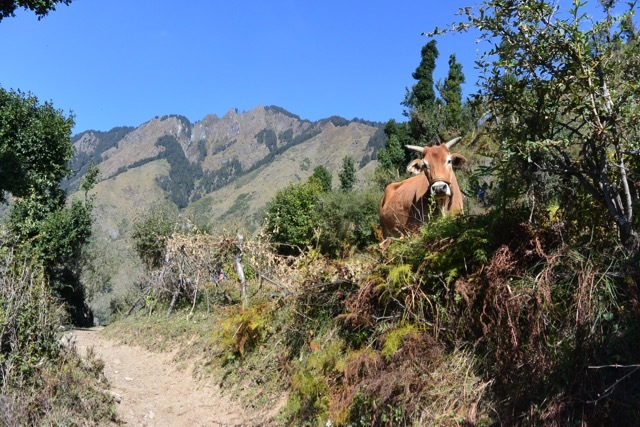 It never failed to amaze, the steepness of the slopes that villages clung to. First night’s camp. The horses were free to wander after their efforts of carrying some of our equipment. Before it went dark some of the distant snow fields were lit by the final rays of the sun. Hopefully promising another good day tomorrow. I was going to post a picture of St Ouen’s Bay this evening, looking great in the late evening sunshine until I came across the news that Audrey Sutherland, author of “Paddling Hawaii” and “Paddling My Own Canoe” had sadly passed away on the 23rd February at the age of 93. She embarked on wilderness journeys starting in 1962, when she swam along the northern shore of Molokai. She moved up market a few years later when she started to explore the coasts of Hawaii, British Columbia and Alaska in a small inflatable kayak. Paddling thousands of miles on exploratory journeys. 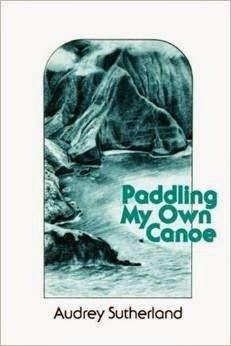 Her most recent book, describing her travels in Alaska is “Paddling North”. She was a truly amazing paddler, pushing the boundaries of exploratory kayaking, defining the limits of what is possible with a minimum of equipment but a major sense of adventure. As sea kayakers we often dream of where we would like to paddle but Audrey was living proof of what was possible if you had the vision and the enthusiasm. 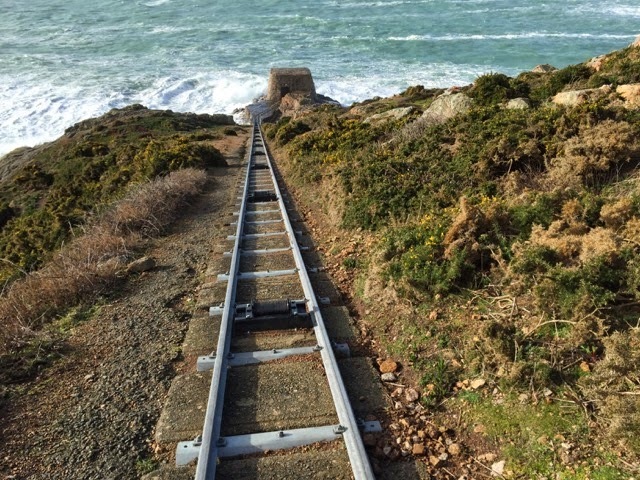 These are probably the newest railway lines in Jersey, having appeared in the last few months. Running down the hillside near the Desalination Plant at La Rosiere, close to Corbiere. When it was commissioned in 1970 it was the first desalination plant in Britain, located in an old quarry which provided some high quality pink granite for part of the Thames Embankment in London. A great section of coast to paddle along, but not today with strong winds and a heavy swell crashing against the cliffs. 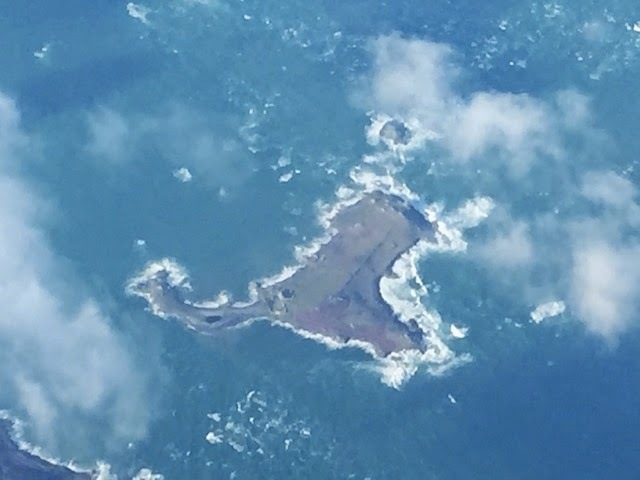 Great view of Lihou Island, just off the west coast of Guernsey as we flew north towards Exeter this morning. Scene of many great sea kayaking days and looking forward to another weekend paddling there with the Jersey Canoe Club in June. 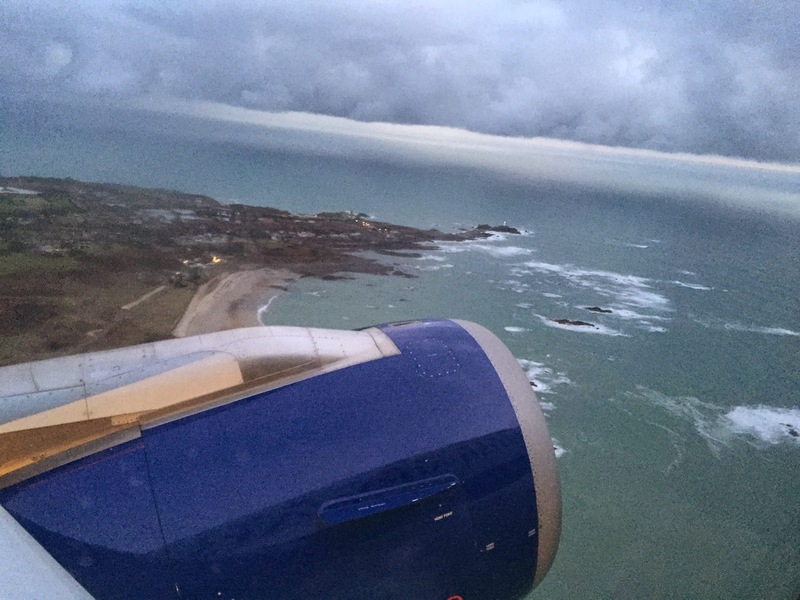 Final approach through the low cloud into Jersey earlier on today. Very large spring tide so plenty of beach exposed at St Ouen’s. Good views of St Ouen’s Pond to the north. 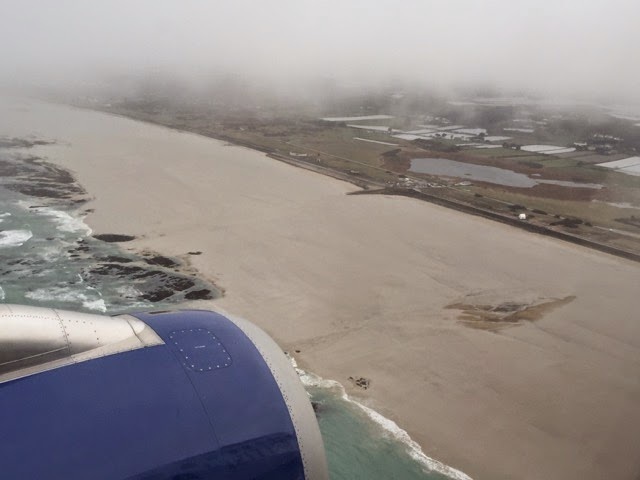 Airborne from Jersey earlier today. The westerly swell, which had been absent earlier in the week, was breaking on the offshore reefs and around Corbiere. Lovely flight, why would anybody ask for an aisle seat?